My go-to banana smoothie! You need less than five minutes to make this easy banana smoothie. Use our simple recipe on it’s own or use it as a base for other smoothies. Jump to the Banana Smoothie Recipe or watch our quick recipe video to see how we make it. 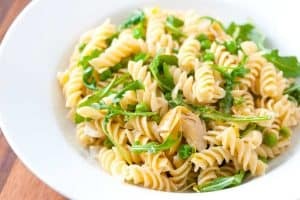 You need less than 5 minutes to make it. You can use fresh or frozen bananas. It’s easy to adapt to what you have in the kitchen. 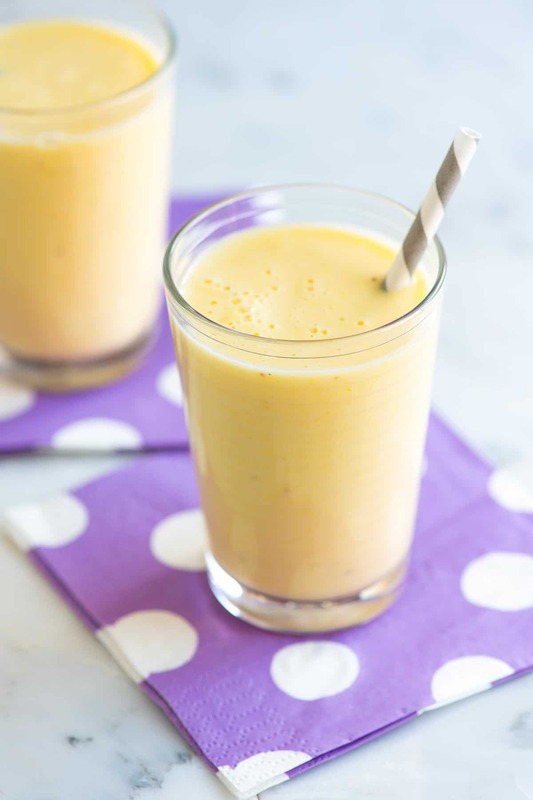 This smoothie is perfect for breakfast or a snack. You can even make the smoothie ahead of time, freeze it, and save for later. Banana — I use one banana to make one large or two smaller (kid-size) smoothies. For the best tasting smoothie, use a ripe banana. For the creamiest banana smoothie, use frozen banana slices (I’ve shared how I freeze bananas for smoothies below). Half an orange — When I have oranges in the house, I love adding them to my morning smoothie. It adds extra vitamin C and tropical flavor. If you don’t have oranges on hand, don’t worry, you can substitute other fruits like mango, pineapple, and berries. Plain or Greek yogurt — To be honest, I don’t always add yogurt to my smoothies, but when I do have it in the fridge, adding a spoonful ensures a protein-packed and creamy smoothie. For a smoothie without yogurt, add a little extra fruit or include veggies (like spinach or kale) instead. Water or milk — To help the ingredients blend, I like adding a splash of liquid to the blender. For a smoothie without milk, use water. It still tastes amazing. For more creaminess use milk (dairy or non-dairy both work). To make the smoothie, I add everything into a blender, and then blend until smooth. For an icy cold smoothie, throw in a handful of ice or use frozen fruits. To make smoothies even easier, freeze fresh fruit into portions. You can even prepare smoothie packs and freeze them for a grab and blend smoothie option. 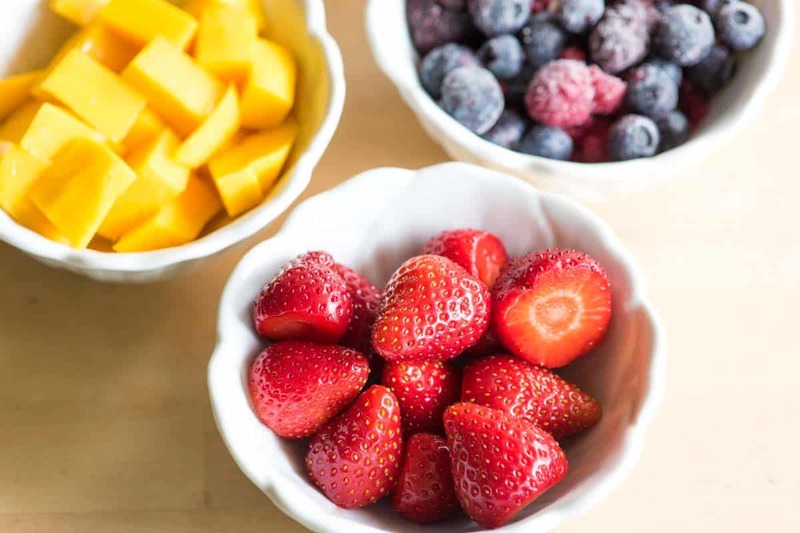 To freeze fruit for smoothies, rinse and chop fresh fruit into small pieces. Pat them dry then arrange, in one layer, on a parchment paper lined baking sheet. Slide the baking sheet into the freezer and freeze until hard (two to three hours). When the fruit is hard, divide it between freezer-safe bags and keep in the freezer for your next smoothie. Add more fruit (fresh or frozen). I love mango, pineapple, and berries. Add greens like spinach, kale, or Swiss chard. I add one to two cups. Add healthy fat with some avocado. Add more protein and fiber with hemp seeds, chia seeds, or your favortie protein powder. Add nuttiness and extra sticking power with a tablespoon of peanut butter, almond butter, or other nut butter. Add some chocolate with a tablespoon of cocoa powder or my favorite, cacao nibs. Add fresh ginger or turmeric or add dried spices like ground cinnamon or ground turmeric. Make this protein-packed green smoothie recipe with fresh spinach, banana, orange, and Greek yogurt in under 5 minutes. Our easy blueberry smoothie recipe that keeps you happy for hours. One small smoothie offers almost 5 grams of fiber as well as 5 grams of protein. With 6 grams of protein and 7 grams of fiber, this utterly delicious strawberry banana smoothie will keep you full and energized for your day. Our banana smoothie is extra creamy and fruity. Depending on how ripe or sweet your banana and orange are, you may need to add a little extra honey, so add based on your taste. There are many additions you can make here, try adding 1/2 a cup to a cup of fresh greens, such as spinach for a green smoothie. Also, you could add 1/2 a cup of strawberries, mango, frozen berries, pineapple, or other favorite fruit. Roughly chop banana and orange quarters then add to a blender. Top with yogurt and the water (or milk). Turn blender on and blend until creamy and smooth. Taste then adjust with honey if needed. 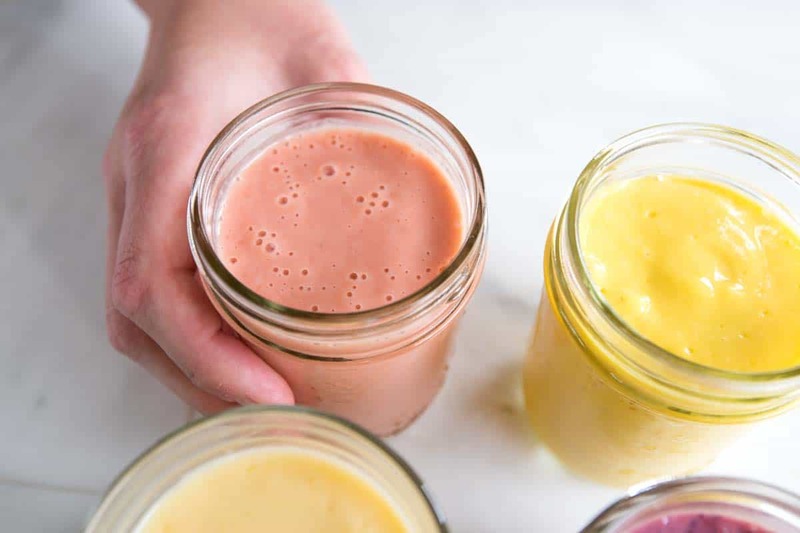 How to Freeze or Make Ahead: This recipe makes one smoothie or two kid-size smoothies. Enjoy now, or save for later. To save the smoothie for later, pour each serving into a food-safe resealable plastic bag or container and freeze. Then, about an hour before needing the smoothie, take out from freezer. Non-Dairy alternatives: If you are looking for a banana smoothie without yogurt, then simply leave the yogurt out of the recipe above and replace with more banana, a tablespoon or so of nut butter, mango, or a tablespoon of hemp seeds (great protein source). You may need to add additional water or non-dairy milk to thin the smoothie out a little. Nutrition facts: The nutrition facts provided below are estimates. We have used the USDA Supertracker recipe calculator to calculate approximate values. Subscribe to our newsletter with easy, delicious, and fresh recipes and receive our eCookbook with 16 of our most loved recipes for free! Click Go to signup for free! i looove this banana smoothie. a nice change from peanut butter banana smoothie!😋 thanks guys. Looking forward to following your blog! Thanks! 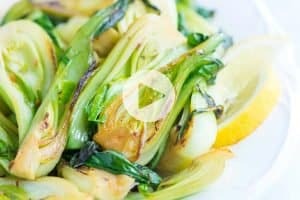 Subscribe to Inspired Taste's free newsletter to receive hand-picked recipes and as a thank you for joining our community, we will send you a link to download our free eCookbook! We are so happy you’re here. We’re Adam and Joanne, the creators of Inspired Taste. 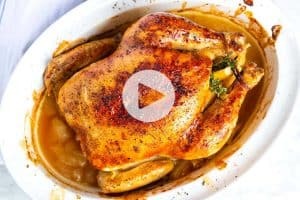 We develop the recipes, photograph, shoot videos, and we’re the ones answering your cooking questions. More about us..
© 2009-2019 Inspired Taste, Inc.